o start working with logs the first step is to load the appropriate layout if it is already existing. Ascolog Insight is delivered with some default layouts. In order to open a layout go to the Layout menu and you select Load... or Reload... The command Reload… does the same as Load... with the exception that any open log files are not closed. Both commands will open a file browser dialog (see figure Loading a layout). Browse to the location where the layout is stored. 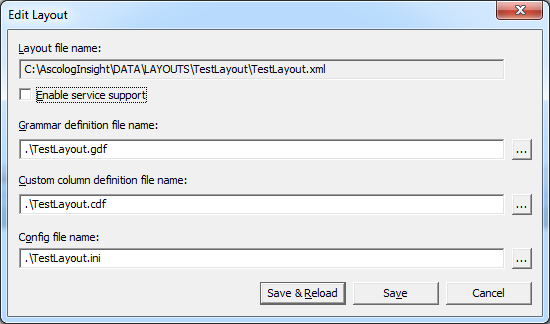 The default location for the layouts in the file system depends on the installation method you used (setup or XCOPY). Where you find the default location is described in How to Install. Select the layout file you want to open and press Open. 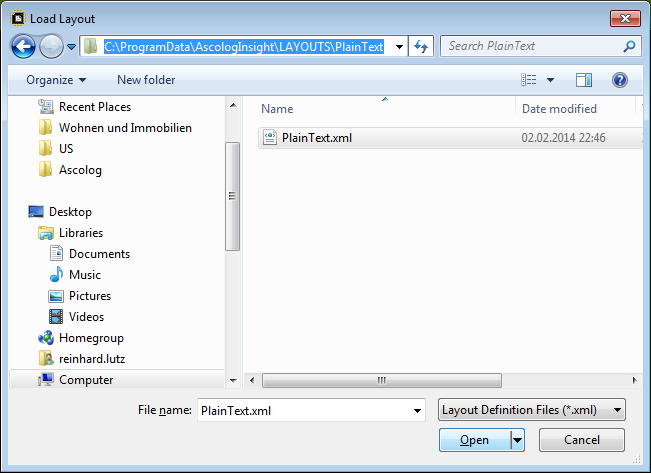 Layout files have the extension “.xml”. In the Status line you see the currently used layout. The Layout menu offers the possibility to save layouts (Save or Save as...). When you use Save as... you have to specify a file name for the layout. A layout consists of several files. Open the Layout menu and select Edit Layout to change any of these files or to enable service support (see chapter Ascolog Insight as Windows Service). This will open the dialog shown in figure Editing a layout. If the settings are correct press Save to change the layout or Save & Reload to change the layout and to immediately apply the changes.